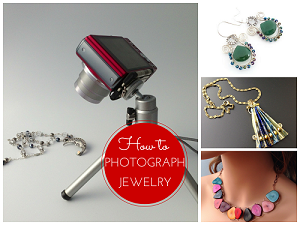 Remember my translucent screen printed jewelry tutorial? Well, I really like the idea of making translucent pieces. So when Wendy of Shades of Clay offered to let me have a go with translucent Pardo clay, I jumped at the chance! 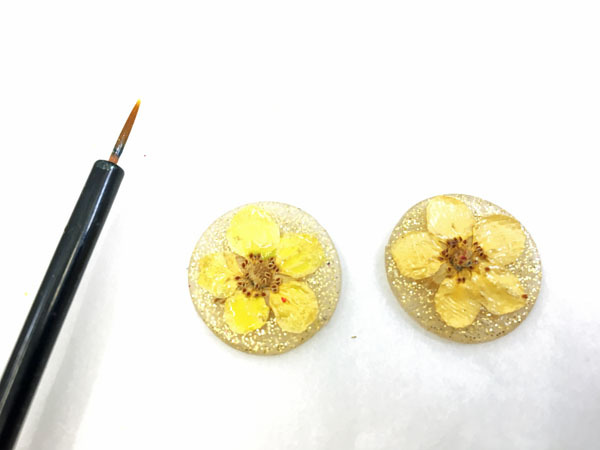 I experimented with making real flower jewelry using both this unique polymer clay with resin. 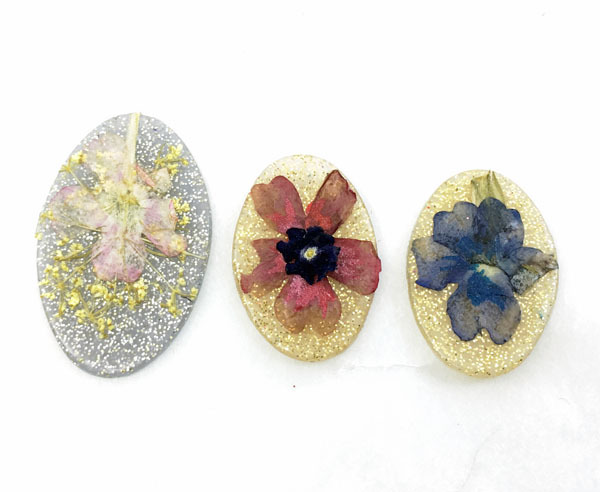 I have used resin molds before for making real flower designs (see tutorial here). 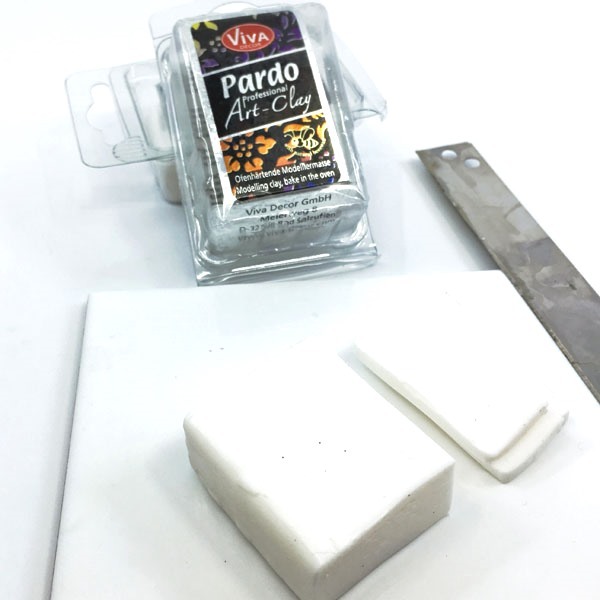 What this tutorial does instead is to use the Pardo clay as the foundation and thus eliminate the need for a mold. 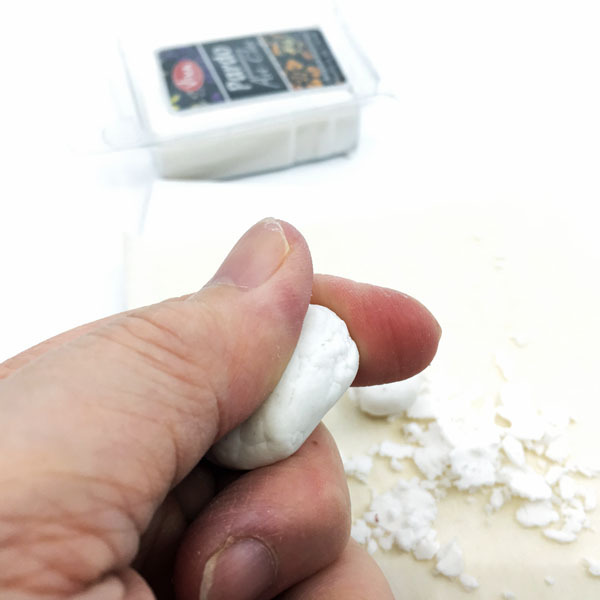 It was easy enough to cut a few slices of the clay with a tissue blade. 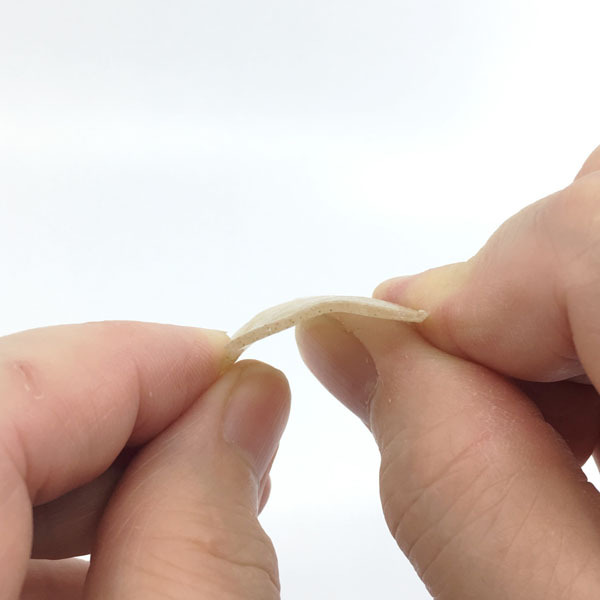 As you know, the next step is to condition the clay which is typically done by running the slices through a pasta machine a few times until the clay becomes a soft pliable sheet. Well, panic ensued when all this clay did was to crumble despite me gathering up the crumbs and putting it through the pasta machine again. 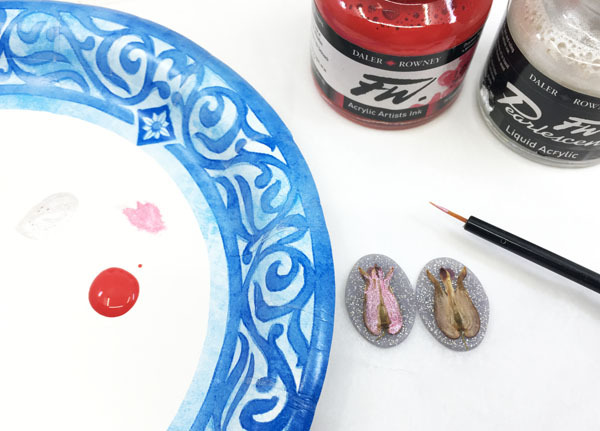 So I went over to Ginger Davis Allman's tutorial on how to condition condition translucent clay! Her tip on warming the slices first and working patiently with it eventually allowed me to run it through the pasta machine. 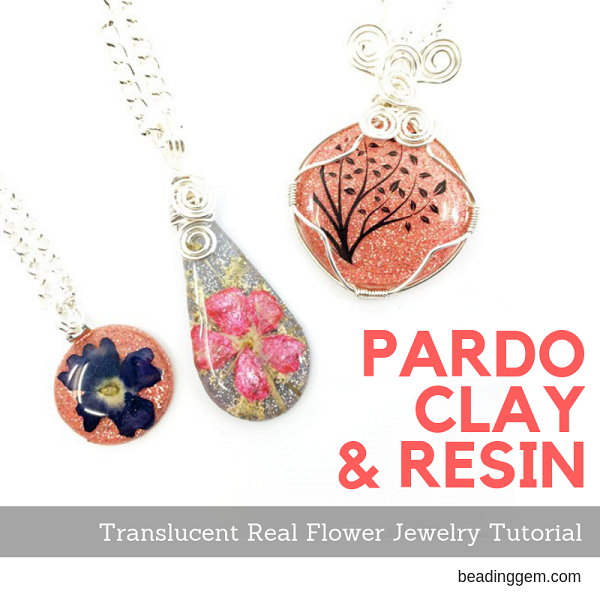 Please read her other post on Pardo clay because it is different from regular polymer clay. She also includes some beautiful examples of what you can do with it. 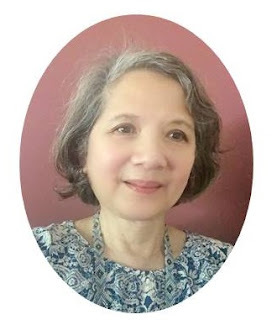 I also wrote about Nan Smith's tutorial. Pardo Clay has a shorter shelf life. It is easier to use when it is fresh. I received 2 boxes of Pardo clay from Shades of Clay. Although both were from the same manufacturing batch, one was easier to use than the other. I can only guess that perhaps there is small pin hole or similar in the container which altered the conditions inside causing one clay to behave differently. I just rolled out the clay to the thickest setting on my pasta machine. I laid the sheet on a piece of baking parchment paper and cut out shapes. Pardo clay has a lot of flexibility after baking. This does not matter as we will have a layer of resin which will make the pieces rigid at the end. Wendy stocks only translucent Pardo because people usually tint it themselves. I used different alcohol inks for this tutorial. I just added a couple of drops and then ran the sheet through the pasta machine several times (folding the clay over as well) until the color is evenly distributed. I also added glitter and distributed it by folding and running the sheet through the pasta machine a few times. The translucent clay itself has a mottled appearance. 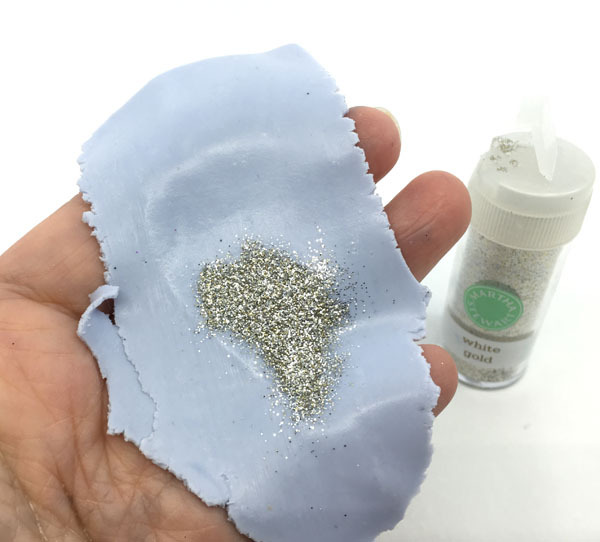 The picture below shows the difference between the natural state and with glitter added. I made a whole bunch! The light blue tint I got darkened to a grey after baking! So be prepared to experiment with pigments to get the result you want. I previously pressed a whole bunch of flowers from my garden using my microwave (see tutorial here). I store them in small plastic containers. Now comes the fun part where I got to design with these pressings. 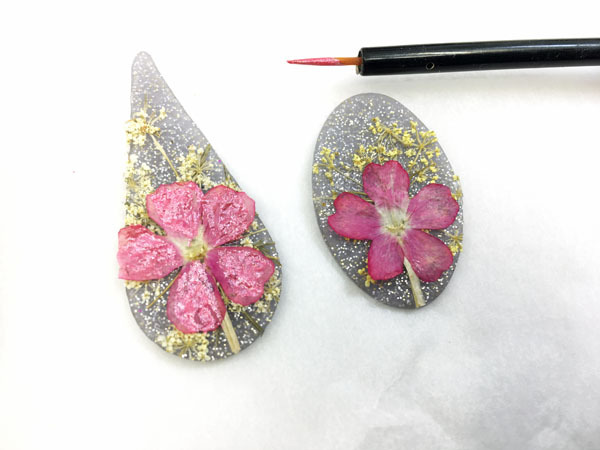 The next step is to glue the flowers to the clay pieces. I have had good results with satin Mod Podge. 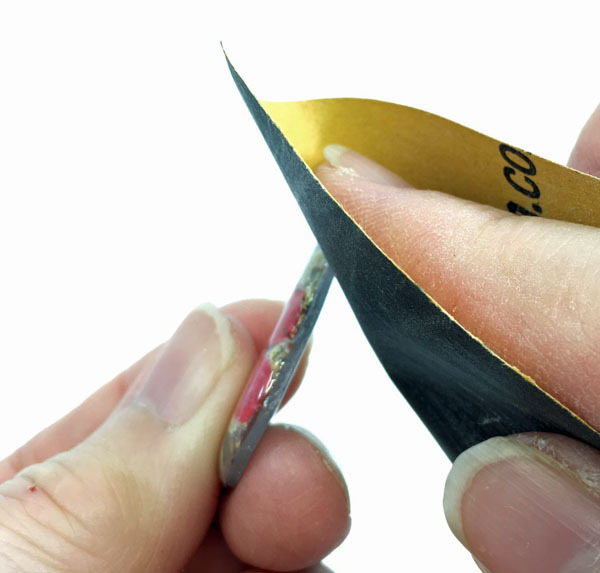 This not only acts as a glue but also as a varnish to cover the pressed flower. The protection is necessary as my previous experiments showed that the resin does affect some petals by making them translucent! 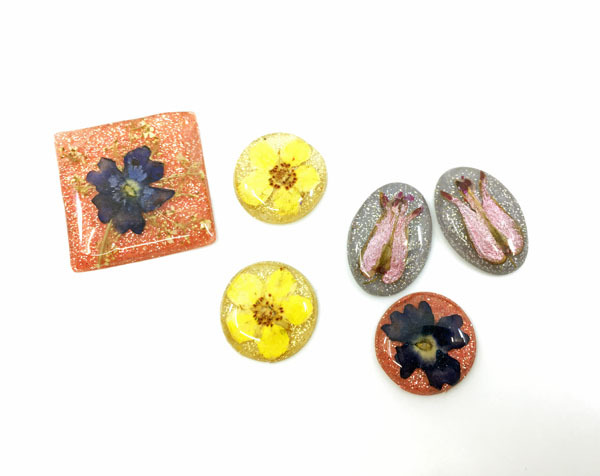 I brushed on some Mod Podge on each clay piece and gently pressed the flower on it. 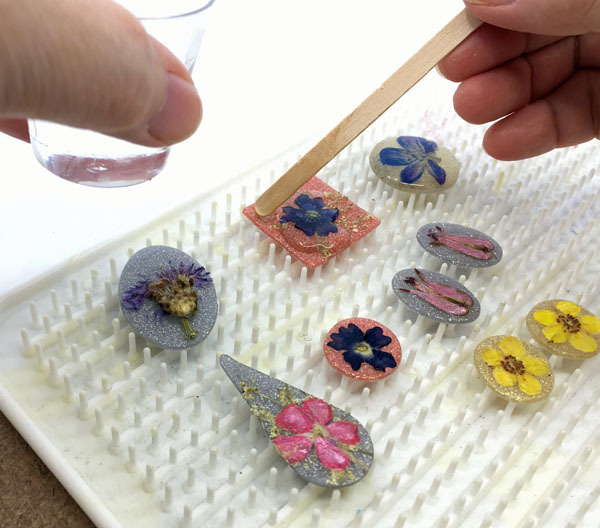 Let dry completely before applying another 1-2 layers of Mod Podge over the flower. You risk tearing the flower if you do not let it dry. 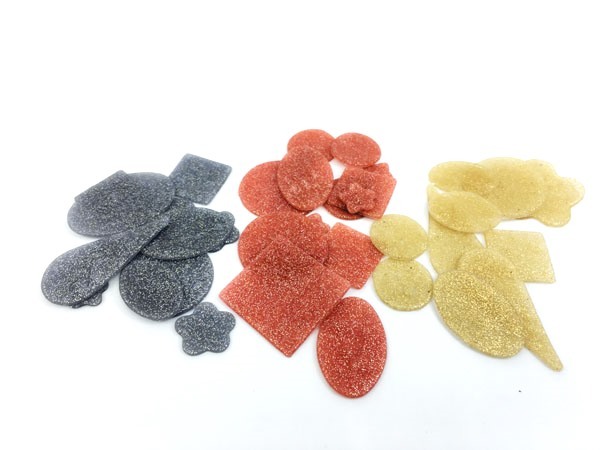 Once all the flowers are sealed, the excess organic material is carefully trimmed away. Some flower pigments fade faster than others. My favorite pressed flowers are from my bleeding heart plant. But as you can see these lost their pink color. 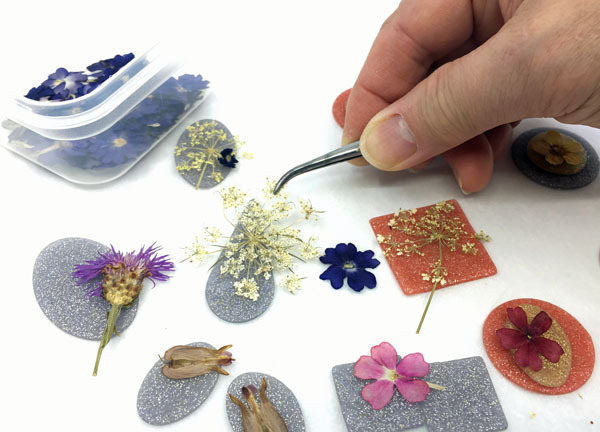 But you can revive the colors as some pressed flower artists do by using acrylic drawing inks. Not paints - these are too thick. 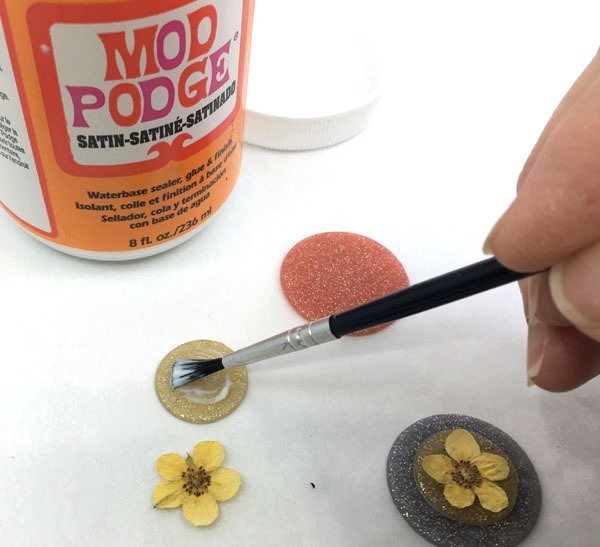 Do this step on any flowers that need the extra oomph before you add the final Mod Podge layer(s) over the flowers. This seals everything. I used a mixture of Daler and Rowney's primary color set as well as their pearlescent one. Old cosmetic brushes are well worth saving for this delicate work! 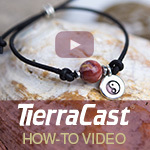 See this past tutorial for more details. I used some pearlescent acrylic inks on the flower on the left, the unpainted one is on the right. 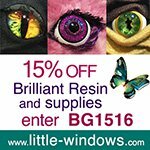 I used Brilliant Resin from Little Windows (15% discount code for readers - : BG1516) which I like very much. 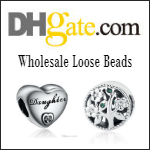 Excellent quality for jewelry making. Also a low bubble producer. I mixed up a small amount following the instructions. 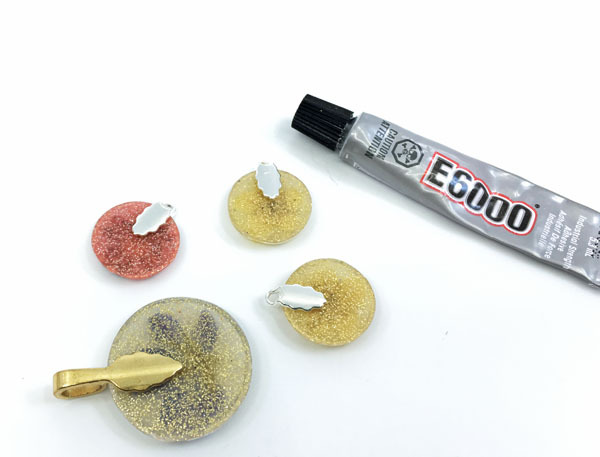 As with all resin projects, always have other side projects on hand to use up every bit of the prepared resin. I also like their silicone doming tray shown below. Accidental spillage is no big deal. One tip - put the tray on a clipboard or flat plastic tray - makes moving the whole thing a lot easier. Be sure to check for stray bubbles after about 15 mins. Re- cover and let the resin cure overnight. Sand any slightly rough edges with dampened wet/dry sandpaper - 400 to 600 grit to start with. Go higher if things aren't smooth enough. I actually had to add a second layer of resin over some of the pieces for better coverage. 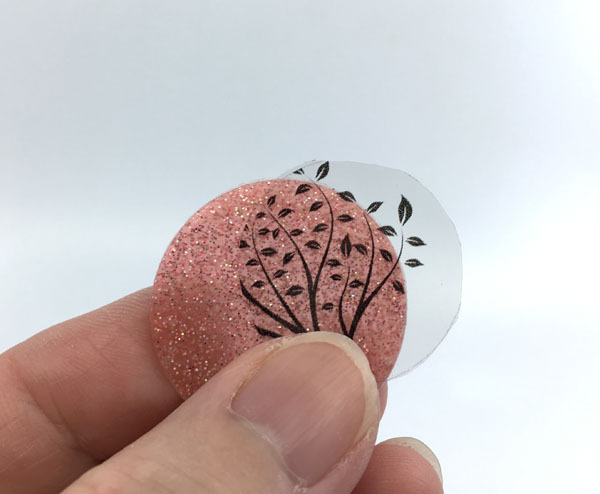 If this happens to you, bear in mind that there is a risk of de-laminating the layers when you drill holes (see my translucent screen printed jewelry tutorial for details). 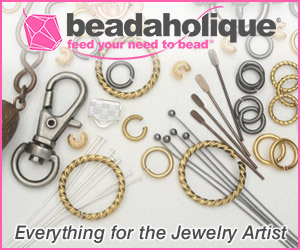 So this is why I used glue on bails and stud earring posts. 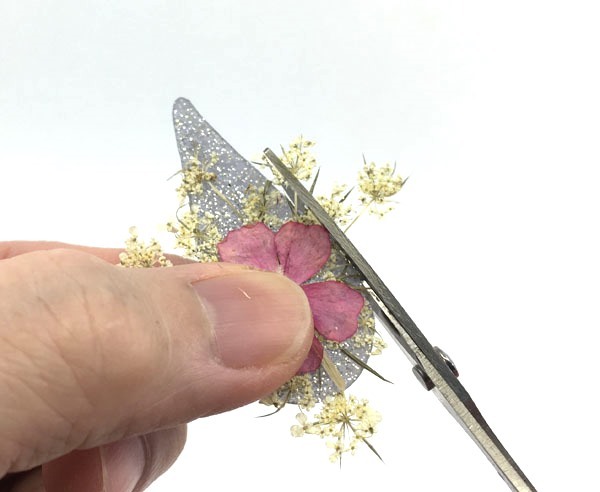 Don't want to get into real flower jewelry work? You can use digital images instead! These were the from the same batch of laser printed images I used for making really easy resin pendants. The tree of life printable download was from 6DogArtsCollage. 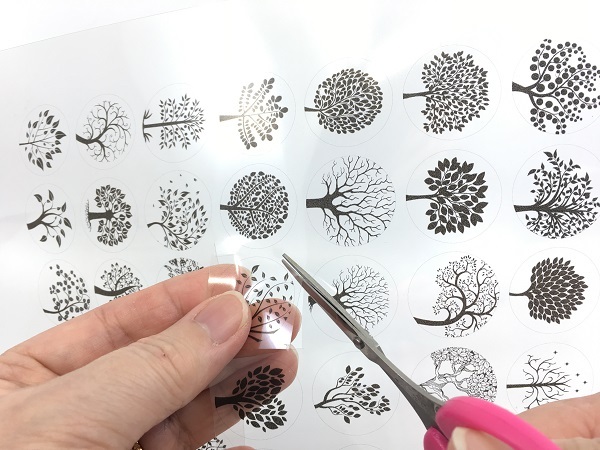 You do not have to be very precise with the cutting out either as the edges will not be visible with the resin. I added a thin layer of resin and then slid in the transparency sideways. This reduces the chances of trapping bubbles underneath. Then I domed with more resin on top. I tried not to add too much resin. I watched carefully and swiped away some drips with a toothpick. This just helped keep a clean edge. 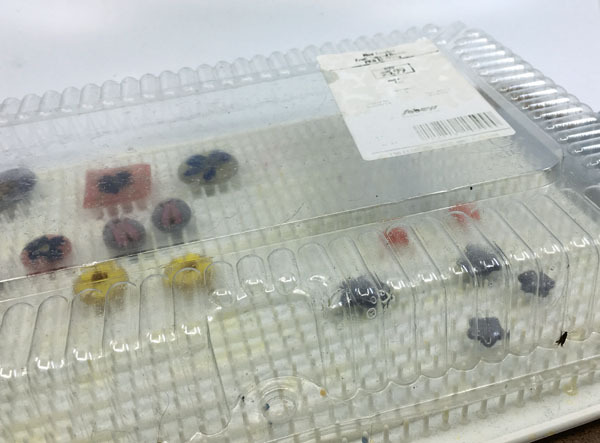 Ignore the drips at the bottom of the doming tray - these can easily be removed once cured. Mod Podge works. 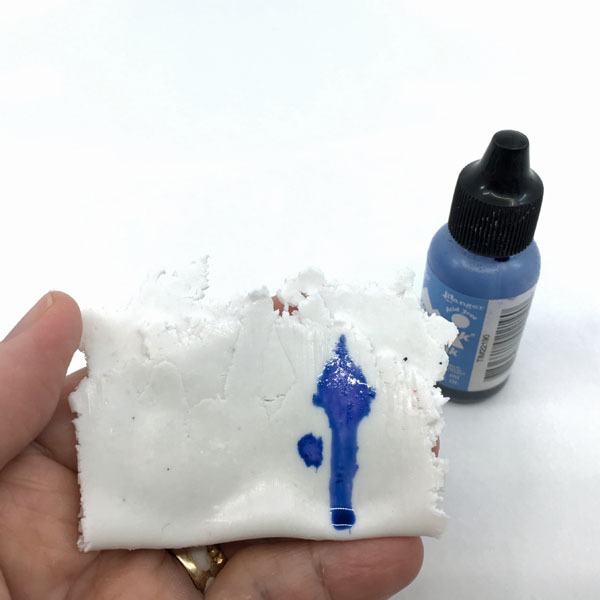 I do not recommend using the kind of varnish most polymer clay artists use to seal the clay. 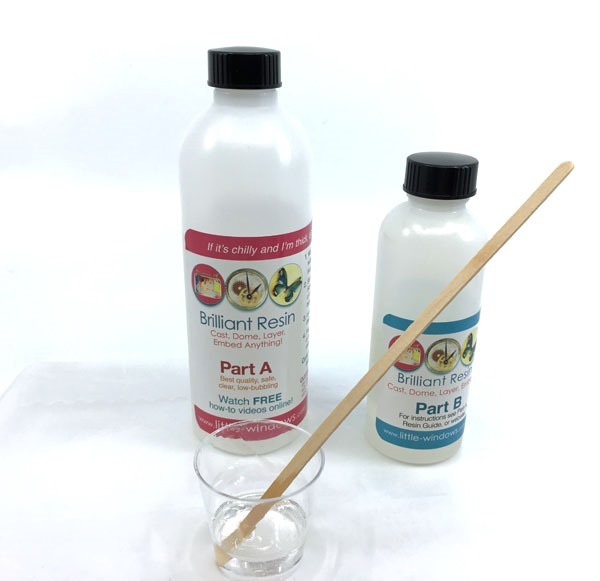 I did use this Varathane varnish as the sealer for this tutorial as an experiment and had mixed results. 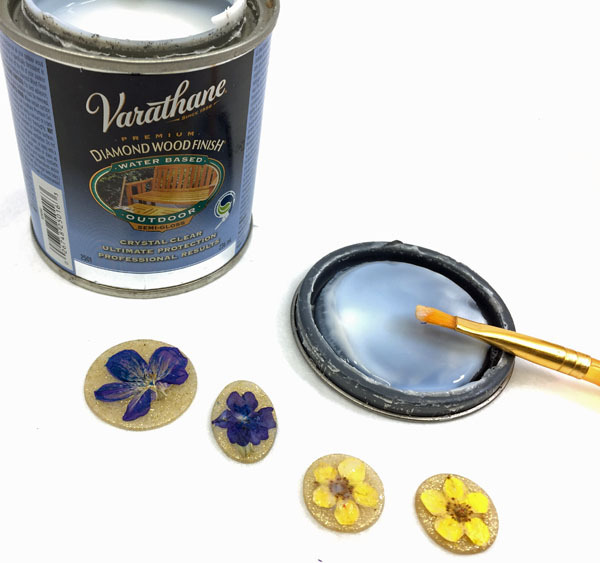 The varnish interacted and bleached out a lot of the flower pigments. Some severely affected examples are shown below. The flowers that were unscathed were those which I had painted over with acrylic inks. You could add pressed flowers with more depth. But, meh. Not worth the trouble. First issue I encountered was the stem of this flower. It was high up. I thought I could probably cover it with resin. But in the end, I trimmed it and used Mod Podge to glue down the stem. 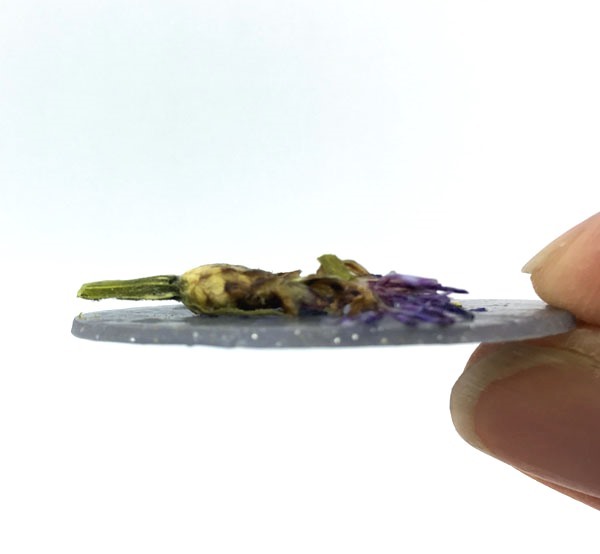 The pressed flower was so thick that two resin layers were not sufficient to cover it. Also the resin did not flow evenly and the coatings were actually lopsided (not shown). So further resin layers were needed. 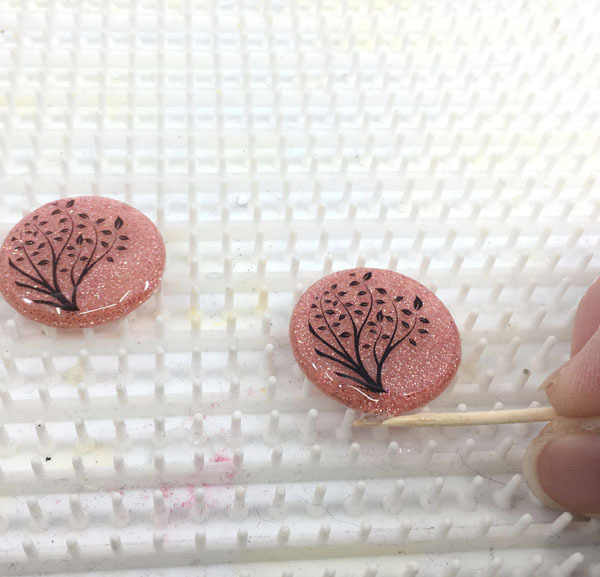 The little star stud earrings were difficult to resin up because I had trouble balancing and keeping them steady on the Little Windows doming tray. So I used a Cuisineart silicon trivet (you could also try a honeycomb trivet). It works so long as you are very careful with no overflows. I did have an overflow with a larger piece. The excess resin stuck to the main piece because the wells are so shallow and the drips had nowhere else to go. 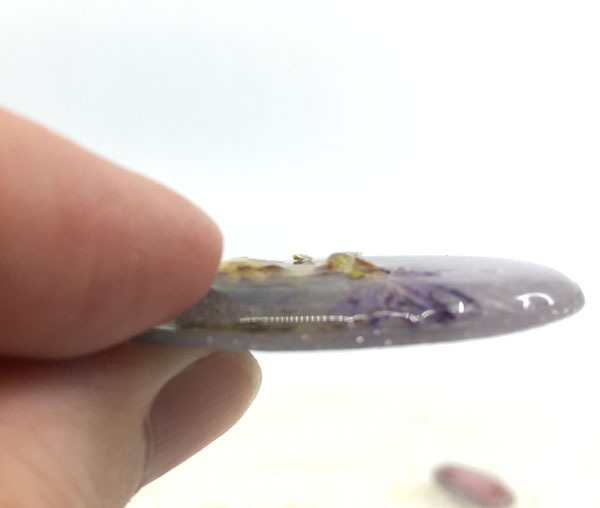 I was able to pull off the excess resin bit but the attempt distorted that top edge (see picture below). This means I will have to really sand down and level that edge. Putting resin over polymer clay really gives the pieces a slick look! Much better than a varnish application! 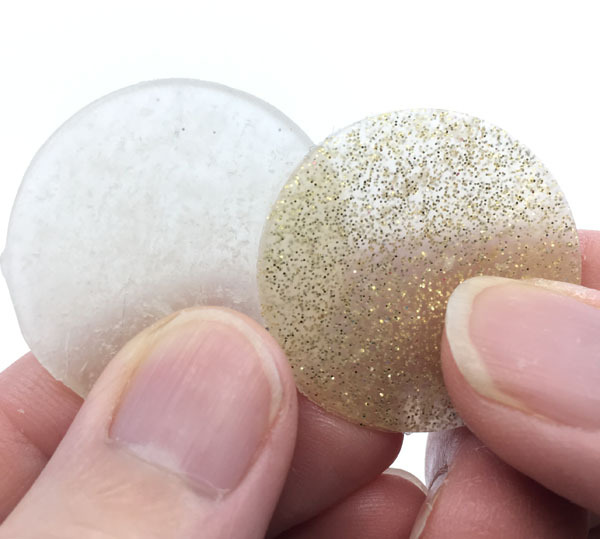 See this past post which compares textured polymer pieces with and without resin. My favorite were the oval bleeding heart stud earrings! I glued the stud posts towards the top. I attached the earrings to some plastic canvas to take this photo! Since I was avoiding drilling any holes, I used not just glue on bails but some wire work to create two of the pendants below. I did use some glue to ensure the tapered wire work stayed on the tear drop one. 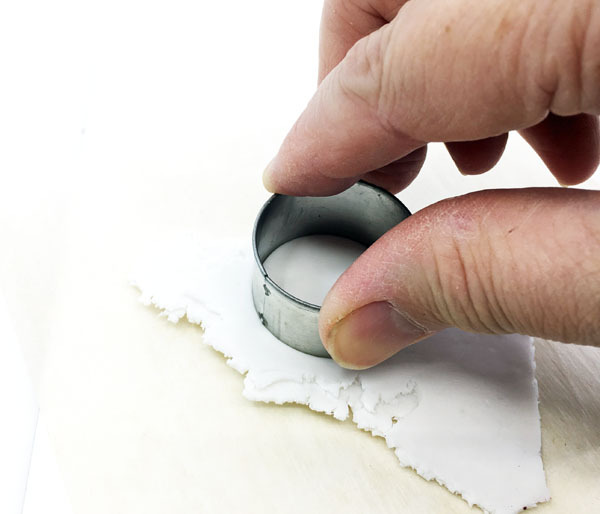 How to Use the Split Mandrel for Easy Power Sanding! 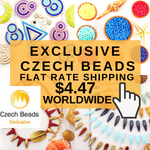 Pretty organic jewelry! Thank you for taking the time to make so thorough tutorials! You are so welcome! I hope everyone learns from my tutorial ....and my mistakes. It took quite a while but I had fun. 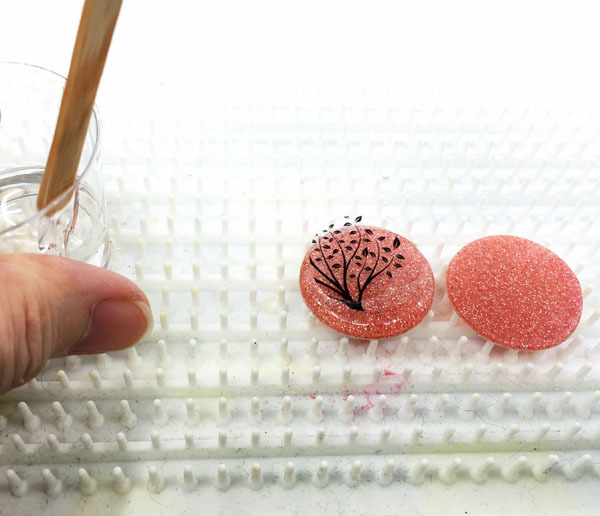 I am glad you learned something even if you do not do resin work. All I can say is Wow. I'd like to hang out at your house when you are experimenting. Thanks. Good question Fran! The answer is no, not at the thickness I was using. It may be possible if I have rolled it out thinner but I haven't tried this. Looking forward to hearing from someone who will!! LOL! I am not sure you want to see the mess in my studio when ideas are flying! !